Good preparations are essential for informative analysis of both somatic and meiotic chromosomes, cytogenetics, and cell divisions. 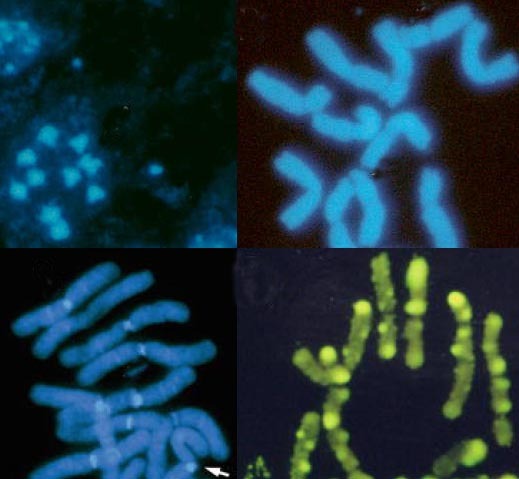 Fluorescent chromosome staining allows even small chromosomes to be visualized and counted, showing their morphology. Aneuploidies and polyploidies can be established for species, populations, or individuals while changes occurring in breeding lines during hybridization or tissue culture and transformation protocols can be assessed. The process of division can be followed during mitosis and meiosis including pairing and chiasma distribution, as well as DNA organization and structure during the evolution of chromosomes can be studied. This chapter presents protocols for pretreatment and fixation of material, including tips of how to grow plants to get good and healthy meristem with many divisions. The chromosome preparation technique is described using proteolytic enzymes, but acids can be used instead. Chromosome slide preparations are suitable for fluorochrome staining for fast screening (described in the chapter) or fluorescent in situ hybridization (see Schwarzacher and Heslop-Harrison, In situ hybridization. BIOS Scientific Publishers, Oxford, 2000). This entry was posted in chromosomes, cytogenetics, Publications, Techniques and tagged breeding, Chromosome, chromosomes, cytogenetics, DAPI, evolution, Fluorochromes, genomes, genomics, heterochromatin, hybridization, imaging, in situ hybridization, meiosis, metaphase, methods, microscopy, molecular biology, Proteolytic enzyme. Bookmark the permalink.